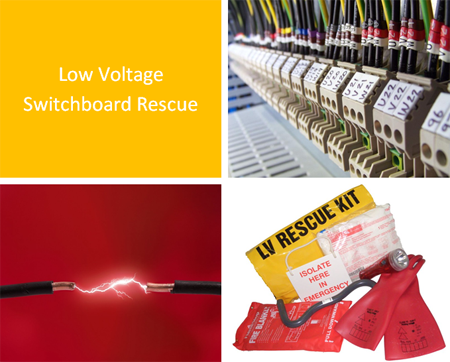 Low Voltage Switchboard Rescue & CPR. This course develops the knowledge and skills required for Electrical Safety Observers to perform a safe rescue of a casualty who has received an electric shock orother injuries while working on low voltage conductors or equipment. This Nationally Recognised course has been developed to provide participants with the theory and practical knowledge to enable them to safely perform a rescue of a victim who has received an electric shock or personal injuries while working on low voltage connductors or equipment. This course provides the participant with the skills on how to manage danger of accidental electrocution. At the completion of the course trainees will be competent to rescue and provide resuscitation to a person who has stopped breathing or is unconscious due to electrical shock. This course is specifically designed for participants requiring qualifications as a Safety Observer for live low voltage switchboard work to comply with Australian Standard AS/NZS 4836:2011 and Electrical Safety Regulation 2002 in regards to Safety Observers.